The BHS Single Side Battery Extractor (BE-SS) is the ideal forklift battery changer for facilities with floor-level system stands and space at the end of the aisle. The BE-SS shares the tough steel construction that makes the entire line of BHS Battery Extractors a dependable option for everyday use, and its fully hydraulic motive systems ensure a lifetime of stress-free battery change-outs. Click any of the above links to explore options for the BE-SS, or call our sales team at +1 314 423 2075. 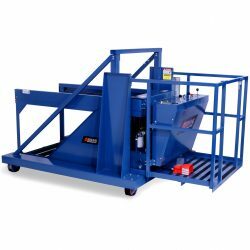 Every BHS Battery Extractor improves efficiency in battery room processes, and the BE-SS achieves remarkably fast battery changes with track-mounted floor travel and an 8″ urethane drive wheel. A hydraulic extractor arm tugs batteries out of forklift compartments with 1,000 pounds of vacuum-gripped draw bar pull. Magnetic extractors are also available for batteries with a narrower profile. The Single Side Battery Extractor’s roller bed protects battery cases from excessive wear and reduces stress on mechanical components. Operator Control Console Placement – This operator-aboard battery changer positions the platform and controls at the rear of the vehicle. This gives operators an unobstructed view of all battery changing processes, improving safety and productivity. Staff-Friendly Working Surfaces – Operator platforms include Anti-Fatigue Mats, which further improve ergonomics. A thick PVC sponge surface improves traction, preventing slips as operators step into and out of the battery extractor. Pedestrian Warning Options – The BE-SS can be fitted with alarms, strobe lights, and even a full Safety Scanner system to ensure that all battery room staff are protected. Alarms and strobes activated whenever the machine operates, clearly notifying staff of the travel path. The BHS Safety Scanner (BE-SICK) integrates into the travel system, automatically stopping movement if it senses a pedestrian in the way. Fully Enclosed Components – Exposed machinery can collect dirt and debris that obstructs operation and leads to greater maintenance requirements. Uncovered mechanical systems can also be a safety risk for operators — which is why BHE Battery Extractors do not expose any vital components. Virtually every moving part is covered to keep systems running smoothly and operators safe. Download the PDF at the link above to explore the BHE BE-SS and the entire family of BHS Battery Extractors. For even more information, fill out the Info Request form here . To locate a dealer near you, call our sales department at +1 314 423 2075.